Are jellyfish taking over the world? Recent reports of havoc caused by proliferations of these gooey, brainless creatures indicate that the suggestion is not as unlikely as it sounds. 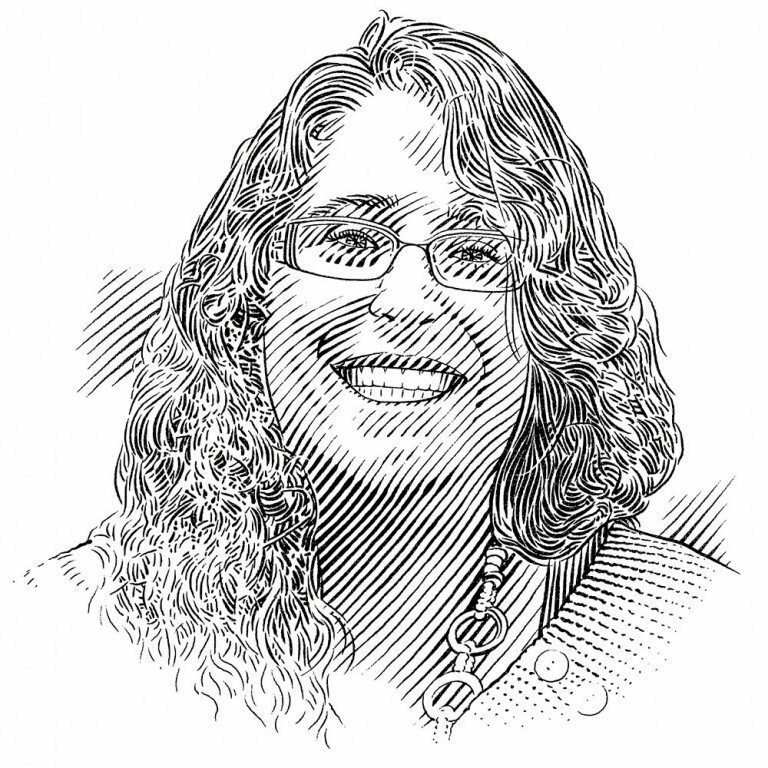 Lisa-ann Gershwin explains why jellyfish are thriving. The world’s worst pest: accidentally introduced into the Black Sea via ballast water, the sea walnut Mnemiopsis leidyi spread rapidly and within just a few years its population comprised 95% of the Black Sea’s total biomass, causing fisheries and the local ecosystem to collapse. Now the species has spread to the Mediterranean and Baltic seas. When we think of the ocean, many of us think of romantic walks with the one we love, or of making sandcastles on the beach as a child, or of scuba diving a coral reef where the only sounds we hear are those of our own breathing and heartbeat. Or we may think of bountiful seafood: lobster dipped in lemon and butter, salmon on the grill, a clam bake with friends. The ocean is a place of celebration, adventure, discovery, industry and solace. Writers write about it. Painters paint. Singers croon. Poets wax lyrical. Hundreds of millions of people around the world depend on the ocean for their primary source of protein. Many more make their living from it. And all of us, 7.3 billion and counting, still carry the ocean’s salty signature in the blood that courses through our veins. We love the ocean. We need the ocean. We are made of ocean. But many of us are unclear about what is happening to the ocean, where it will lead and, more to the point, what – in plain English – does it mean for our future? There is a stark reality in many places around the world that makes the state of the ocean a far cry from our romantic vision. Waterways stagnate with putrid, foamy brown bubbles. Beaches are littered with plastic drink bottles and used syringes, and tiny pieces of plastic now mix with sand. Fish have tumours. Reefs are bleaching. And vast stretches of coastline have become dead zones, where even the worms are struggling for oxygen. One organism, however, is thriving in these impacted oceans: jellyfish. A file photo taken on October 4, 2006 shows a diver attaching a sensor on a large Echizen jellyfish off the coast of Komatsu in Ishikawa prefecture, northern Japan. The dramatic proliferation of jellyfish in oceans around the world, driven by overfishing and climate change, is a sure sign of ecosystems out of kilter, warn experts. Two centuries worth of data shows that jellyfish populations naturally swell every 12 years, remain stable four or six years, and then subside. 2008, however, will be the eighth consecutive year that medusae, as they are also known, will be present in massive numbers. The word makes some of us recoil a bit, either frightened by the recollection of stings or put off by the ‘goo’ factor. Others go all melty in the heart, remembering beautiful jellies in an aquarium exhibition or in a fascinating documentary on television or from photos online. A few perk up with curiosity, as jellies have inspired artists and compelled nature-lovers since time immemorial. Jellyfish are different things to different people, but one thing is certain: they are commanding attention. Jellyfish blooms are causing all kinds of havoc around the world. We normally think of stings when we think of jellyfish, but stings are often the least of our worries. Seawater-cooled power plants the world over undergo emergency shutdowns when swarms of jellyfish are sucked into the cooling intake pipes – and that happens more often than one might think. This is not only disruptive and expensive but, in the case of nuclear plants, can be dangerous. So too, desalination plants, water-cooled data centres and even cruise and cargo ships are suffering this fate. Take for example the USS Ronald Reagan, in 2006 the newest, largest and most expensive super-carrier ever built in the USA. On its maiden voyage, its first port of call was Brisbane in Queensland, Australia. This ship was designed to stay at sea for 20 years without refuelling and to take on any country’s might or nature’s most furious wrath. But it wasn’t prepared for jellyfish. Thousands of sea blubbers Catostylus mosaicus disabled the engine’s cooling system, triggering an emergency evacuation and system shutdown. This was not only embarrassing to the US Navy, it was also a rather colourful example of an all-too-frequent occurrence. Consider also the case of the giant jellyfish in China and Japan. Nomura’s jelly Nemopilema nomurai is an incredible beast, reaching some two metres (six feet) across the body and weighing in at some 200 kilograms (450 pounds). It is easy to track, because you can’t miss it. Throughout the 20th century it had been reported only a few times. Then something changed in 2000: this sleeping giant awoke, and it has bloomed in truly massive numbers nearly every year since then. It has been estimated that in full bloom, half a billion of these giant jellies drift into the Sea of Japan every day. Half a billion! It appears that the highly impacted seas around China provide a perfect breeding ground for these refrigerator-sized behemoths. Most of the fish have been fished out, so there are fewer predators and competitors. Very high levels of toxic chemicals and nutrients draining into the coastal waters from the cities and farmlands are killing what’s left and triggering microbes and harmful algal blooms. The seabed has been trawled so many times that the original three-dimensional habitat that supported other species is now gone, with the rubble providing new growing space for jelly polyps. And intense coastal construction offers even more growing space. Without meaning to, China has created the perfect habitat for jellyfish. Although most of the ecological and industrial havoc that jellyfish cause involves non-stinging or mildly stinging species, there are a few life-threatening species that are worth keeping an eye on, particularly in tropical regions like Australia, Hawaii, Thailand and the Caribbean. These highly dangerous types fall into two main categories: deadly box jellyfish and Irukandji jellyfish. At least two species of deadly box jellies are known, one from northern Australia and the other off East Asia. The venom acts on the heart by locking it in a contracted state. A typical adult box jelly has a total of 120–180 metres (360–540 feet) of tentacle capacity and needs only 1.4 metres (about 4 feet) to kill a child, or 3–5 metres (9–15 feet) to kill an adult in as little as two minutes (typical time to death is just four minutes). The other highly dangerous group of jellies is the Irukandjis, named after an Australian Aboriginal tribe in the 1950s and comprising roughly 15 species known to date. The initial sting of most of them is mild, but after a characteristic delay of about half an hour a constellation of systemic symptoms kicks in. These symptoms are fully debilitating: severe lower back pain, chest and abdominal cramping, nausea and vomiting, difficulty breathing, drenching sweating and a feeling of ‘impending doom’. Some species also cause severe hypertension (high blood pressure), which can result in a stroke or heart failure. Species that cause Irukandji syndrome are currently known from as far north as Boston and Dublin and as far south as Sydney and Melbourne, and may become more numerous or more venomous as the oceans warm. So let’s take stock: dangerous jellyfish already occur throughout the usable oceans and seas of the world, and non-dangerous species are threatening our fishing, power and shipping industries, as well as the military. As tempting as it may be to blame it on the jellyfish, like the proverbial canary in the coal mine, it’s not the canary’s fault. Jellyfish are merely responding to the conditions that we are creating. In some cases, jellies are a visible indicator that the oceans are out of balance; in others, they act more like an angel of death, hastening ecosystem decline. Another unexpected aspect of jellyfish has recently come to light: it now looks like they may exacerbate climate change and ocean acidification. There is a peculiar property of jellyfish mucus and dissolved organic matter (or jellyfish goo and poo) that favours certain types of bacteria over others. The types of bacteria that flourish here are those that shunt energy away from the food chain and towards the production of carbon dioxide instead. Jellyfish in large numbers, therefore, act like carbon dioxide factories. Jellyfish seem impervious to many of the stressors that affect other species. In fact, some stressors even spur them on. For example, one stressor that is particularly favourable for jellyfish is overfishing. For each fish that is removed, the food that it would have eaten becomes available for others. At first, other fish benefit from this bounty, but as more and more fish are removed, eventually that extra food becomes available for species that are normally outcompeted, like jellyfish. When we remove an individual fish, its entire genetic identity is removed from the gene pool; its progeny will never exist. In contrast, when we remove a jellyfish, its clone mates continue to live and its parent polyp continues to clone more polyps and more baby jellyfish. It is possible to deplete jellyfish populations, as we have seen with long-term intensive harvesting of one species for food in Asia and another species for its green fluorescent protein in the USA. However, the one-to-one relationship between fishing and decline does not exist with jellyfish as it does with fish. So even though jellyfish are not fish in the fisheries sense, they may well be the perfect fish. 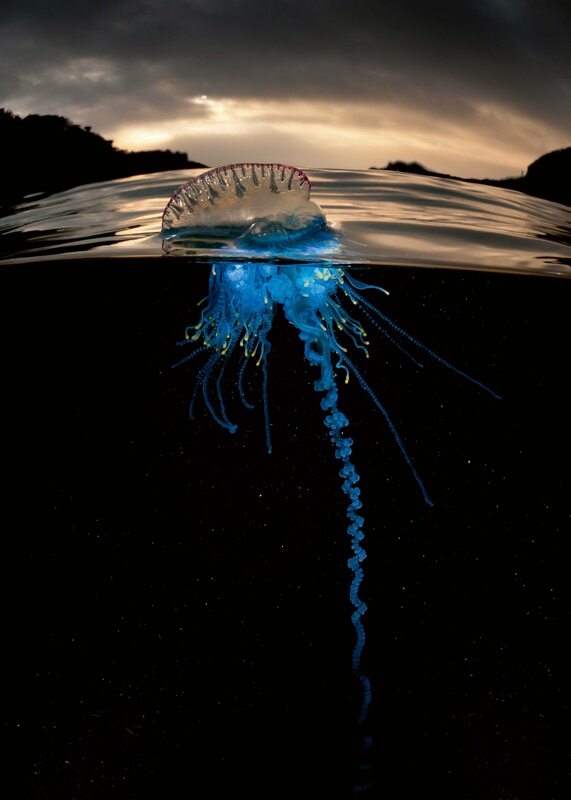 Beauty and the beast: the electric-blue coloration of the Portuguese man o’ war Physalia physalis is a natural warning. When armadas of these strange jellyfish blow towards shore, run! It is estimated that they sting more than a million people a year, sometimes fatally. Another example of a stressor that favours jellyfish is warming. Even a nearly imperceptible increase in temperature reduces the amount of oxygen dissolved in water, so fish and crustaceans must exert more energy to extract enough oxygen to survive. This in turn means that they must find and catch more food just to break even with their increased energy output, which in turn requires more energy. Compared with fish and crustaceans, jellyfish have an incredibly low metabolism – so low that while other species are struggling, they are under no threat at all. Moreover, warmer water acts like steroids for many types of jellyfish, revving up their growth and breeding rates and lengthening their growing season. Even other stressors like pesticide run-off that have little direct effect on jellyfish can nonetheless help boost their numbers simply by making it more difficult for other animals like fish to survive. Thus, as other species struggle, jellyfish find opportunity. It may seem hard to believe that a creature as primitive and mucousy as a jellyfish could somehow be taking over. Fish are faster, smarter and often bigger. And fish are visual predators that can target their prey, whereas jellyfish merely blunder into it. Indeed, in healthy ecosystems fish have a strong advantage over jellies. But as ecosystems falter, they don’t just come to a stop – they transform. Species’ relationships shuffle and new winners and losers emerge. Jellyfish have several key features of their biology that make them particularly well suited to picking up the slack of disturbed ecosystems. Like dandelions and cockroaches, jellyfish have a weedy lifestyle that enables them to flourish. Many have broad tolerances for fluctuations in temperature and salinity. Most are opportunists and are able to breed and grow quickly and eat just about anything. Some don’t need to eat: when food is scarce they just slowly ‘degrow’, or get smaller, then regrow when food becomes available again. But perhaps the most important feature that makes them so tenacious is their life cycle. 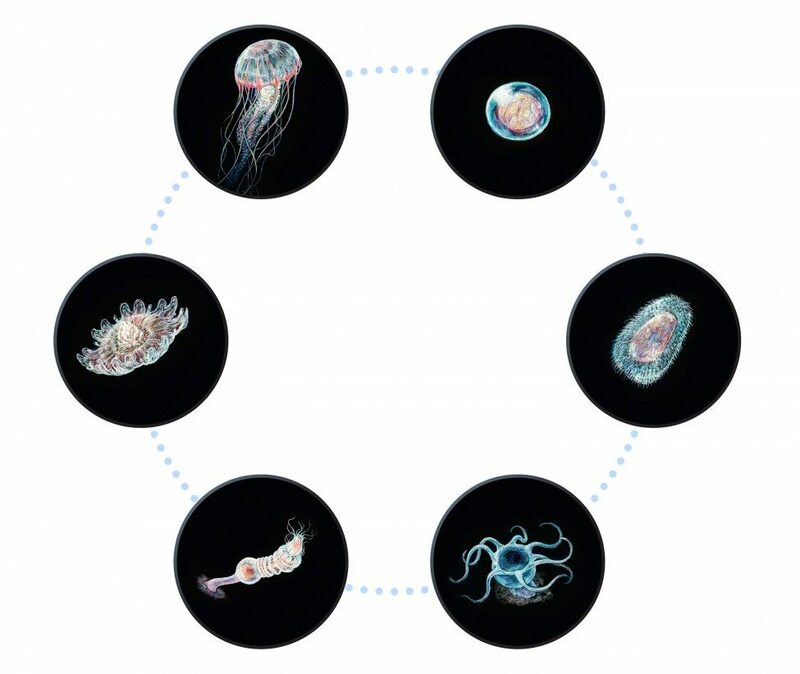 The jellyfish life cycle is completely different from that of any other animal we are familiar with. The jellyfish (or medusa) is only part of the life cycle. Male and female medusae release sperm and eggs into the water or fertilise internally. The resulting embryos develop into tiny larvae that settle on hard surfaces like rocks or shells, and grow into polyps. These polyps resemble minute hydras or sea anemones. The polyps clone many replicas of themselves, creating colonies. When the conditions are right, these polyps undergo a transformative process, triggering them to release baby jellyfish, which then grow quickly into adult medusae. While medusae may live for only a few months, polyps can survive indefinitely by cloning. These polyps act as a seed bank, just waiting for the right conditions. And then whammo – jellyfish appear almost overnight, as if out of nowhere. Jellyfish have a couple of surprisingly simple but stunningly effective means of taking control of ecosystems. Not on purpose, of course, since they have no brain. One of the most effective mechanisms lies in the jellyfish’s generalist feeding habits. Jellyfish eat not only the eggs and larvae of fish, but also the planktonic food that the larvae prey on. This ‘double whammy’ of predation and competition can cripple the food chain at its base, thus impacting the species higher up. This mechanism is particularly relevant for krill and smaller schooling fish species like sardines, where the ecological overlap with jellyfish is very high. Another mechanism that favours jellies is in how they affect energy flow through the food chain. Normally we think of the food chain in more or less linear terms: big things eat little things, fast things eat slow things, and smart things eat less intelligent things. But jellyfish muddle this up. Jellyfish, which are slow and brainless and often small, eat fast fish that are smarter – and often larger – than they are. They don’t eat an adult fish, of course, but they eat its eggs and larvae. In this way, jellies take higher quality food from higher up the food chain and convert it to lower quality food in their own bodies, lower down the food chain. Not many other species routinely prey on jellies, so they are considered a dead-end branch of the food chain. Full moon rising: moon jellyfish Aurelia spp. are increasing in many bays and harbours around the world. They have been responsible for clogging the intake pipes of power plants and the mass deaths of farmed salmon. From the growing number of media reports about jellyfish problems – some are even calling this the Age of the Jellies – the question naturally arises: are jellyfish blooming more, or are we simply more aware of them? The fossil record tells us that jellyfish have been around for at least a half billion years; DNA modelling suggests perhaps twice that long. One particularly spectacular Cambrian fossil quarry in central Wisconsin contains seven consecutive bedding planes of ancient jellyfish blooms, preserved one after another like pages in a history book. This tells us that jellyfish have been blooming since the dawn of animal life – it is just what jellyfish do. Even in the tiny slice of time since recorded history began, jellyfish blooms come and go. The sporadic nature of their occurrence, along with very patchy data collection, makes interpreting their trends difficult. Currently experts debate as to whether there is an overall increase in jellyfish globally, or whether global blooms are more cyclical in nature, or whether the increase in reports of jellyfish blooms is indicative of an increase in disturbed habitats. Many experts favour the last explanation, where jellyfish are merely responding to the conditions that we are giving them. In fact, a couple of recent events suggest that this may be truer even than it seems at face value. For example, jellyfish disappeared almost immediately from a bay previously infested with them as soon as aquaculture installations were removed. It seems that the structures slowed the flow of water and provided settling areas for the jellyfish polyps. Without these two features, the jellies simply died off. Another example is from the King Daddy of all jellyfish problems: Mnemiopsis leidyi in the Black Sea. This American species of comb jellyfish was accidentally introduced in ballast water in about 1982 and within just a few years the population had exploded to become about 95% of the biomass. The unlikely simultaneous timing of three unanticipated events led to its decline. First, as fisheries collapsed, fishing pressure stopped, allowing the fish to begin to recover. Second, when the Soviet Union broke apart, farming subsidies ended, so farmers used fertilisers more sparingly, resulting in less run-off and less hypoxia. Third, a native predator of Mnemiopsis was accidentally introduced into the same area, resulting in natural control. While we can look to both of these examples as encouraging news that jellies can be controlled, the reality is that both required extraordinary disruption that would be unlikely to occur in the Western world. When confronted with the problem of jellyfish, one naturally asks, ‘What can be done?’ The answer, however, is less than straightforward. There is no shortage of uses for jellyfish. For thousands of years jellyfish have been considered a delicacy in Asian cuisines and increasing demand has led to jellyfish harvesting as a lucrative export industry for many nations. So too, numerous intriguing commercial uses for jellyfish have been developed in recent years, including a hyper-growth fertiliser for rice; super-absorbent products like paper towels, baby diapers and sanitary products; and a low-calorie, fat-free thickener for sweets or egg substitute for baked goods. These and many other uses show great promise for the removal of large quantities of pesky jellies from the ocean. So that could be a good thing because, in theory, it will give fish a chance. But will it? There is also a less clear and more variable side to the story: removing jellies may simply open up more eco-space for the next pest in line, probably algae and microbes. Nature doesn’t hold a vacuum until its original inhabitant returns. Nature moves on. Nature adopts a new normal. So as we continue to deplete, poison and warm our oceans and seas, it appears that we are conducting a grand experiment – and nobody really knows the outcome. The actions necessary to budge jellyfish out of dominance seem to be fairly drastic, and in some cases may not be fully effective. A much more sensible approach would seem to be to keep jellies from reaching that tipping point in the first place – and the bountiful seafood, romantic walks on pristine beaches and bustling coral reefs will be a more enduring legacy. 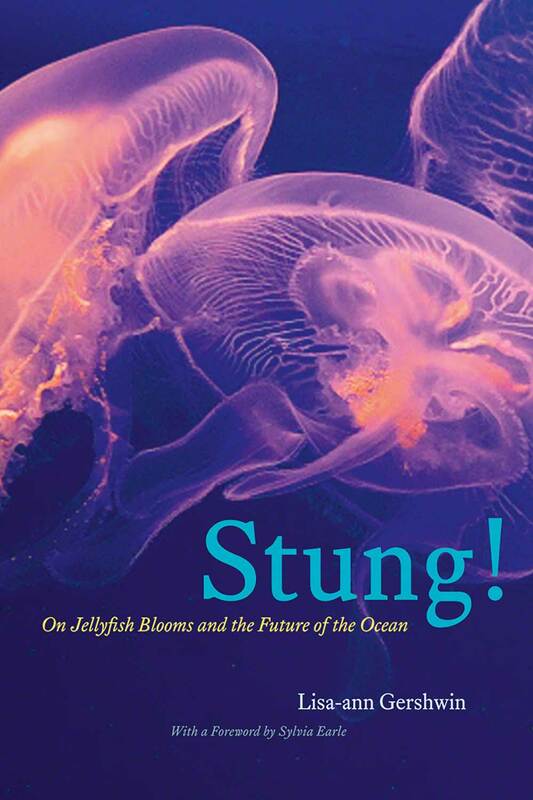 Combining powerful scientific data about human-caused change with surprising vignettes about jellyfish super-abundances, Gershwin’s first book Stung! On Jellyfish Blooms and the Future of the Ocean weaves a compelling story about our effect on the ocean. The collapse of cod populations due to overfishing, the vanishing of the Great Barrier Reef because of ocean acidification, and the Great Ocean Garbage Patches where plastic outnumbers plankton and chokes seabirds – Stung! explains all these phenomena and more, and shows synergies between many of the stressors that are impacting our oceans today. From herbivorous jellyfish starving out penguins in Antarctica to carnivorous jellyfish taking over the seas of Europe, readers on this journey of intrigue will begin to see ‘jellies’ in a whole new light. There is even a remarkable coincidence between Gershwin’s early anti-nuclear activism and her own scientific history. Stung! spent four months as number one in Amazon’s catalogue of marine biology and ecology books for good reason! Brodeur, R. D., M. B. Decker, L. Ciannelli, J. E. Purcell, N. A. Bond, P. J. Stabeno, E. Acuna and G. L. Hunt Jr. 2008. Rise and fall of jellyfish in the eastern Bering Sea in relation to climate regime shifts. Progress In Oceanography 77(2-3): 103-111. Brodeur, R. D., C. E. Mills, J. E. Overland, G. E. Walters and J. D. Schumacher. 1999. Evidence for a substantial increase in gelatinous zooplankton in the Bering Sea, with possible links to climate change. Fisheries Oceanography 8(4): 296-306. Brotz, L., W. W. L. Cheung, K. Kleisner, E. Pakhomov and D. Pauly. 2012. Increasing jellyfish populations: trends in Large Marine Ecosystems. Hydrobiologia 690(1): 3-20. Duarte, C. M., K. A. Pitt, C. H. Lucas, J. E. Purcell, S.-i. Uye, K. Robinson, L. Brotz, M. B. Decker, K. R. Sutherland, A. Malej, L. Madin, H. Mianzan, J.-M. Gili, V. Fuentes, D. Atienza, F. Pagés, D. Breitburg, J. Malek, W. M. Graham and R. H. Condon. 2012. Is global ocean sprawl a cause of jellyfish blooms? Frontiers in Ecology and the Environment 11(2): 91-97. Gershwin, L. 2013. Stung! On Jellyfish Blooms and the Future of the Ocean. Chicago, University of Chicago Press. Lucas, C. H., S. Gelcich and S. I. Uye. 2014. Living with jellyfish: Management and adaptation strategies. Jellyfish Blooms, Springer Netherlands: 129-150. Mills, C. E. 1995. Medusae, siphonophores, and ctenophores as planktivorous predators in changing global ecosystems. ICES Journal of Marine Science 52(3-4): 575–581. Mills, C. E. 2001. Jellyfish blooms: Are populations increasing globally in response to changing ocean conditions? Hydrobiologia 451: 55-68. Purcell, J. E. 2012. Jellyfish and ctenophore blooms coincide with human proliferations and environmental perturbations. Annual Review of Marine Science 4: 209-235. Richardson, A. J., A. Bakun, G. C. Hays and M. J. Gibbons. 2009. The jellyfish joyride: causes, consequences and management responses to a more gelatinous future. Trends in Ecology and Evolution 24(6): 312–322.